Jordisite: Mineral information, data and localities. After Eduard Friedrich Alexander Jordis (1868-1917), colloid chemist. Although generally thought to be amorphous, jordisite gives electron diffraction powder patterns (SAED). It has layered structure, and the layer spacing is ca. 6Å as in molybdenite (Kao et al., 2001). Compare UM2001-03-C:MoS, which has a very similar structural signature: a sequence of curved layers comprising subspherical units. Ilsemannite 7 photos of Jordisite associated with Ilsemannite on mindat.org. 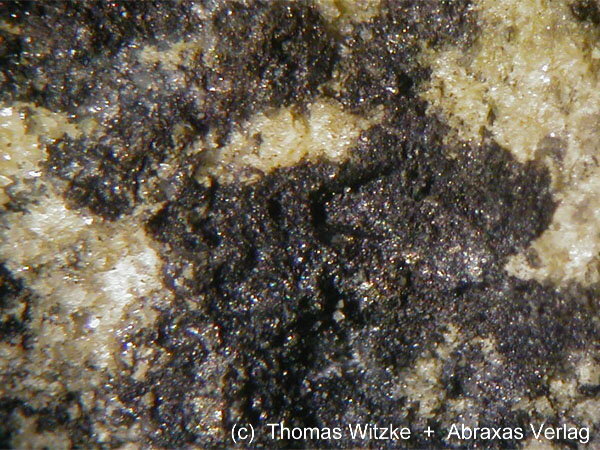 Autunite Group 1 photo of Jordisite associated with Autunite Group on mindat.org. Cinnabar 1 photo of Jordisite associated with Cinnabar on mindat.org. F. Cornu (1909): Natürliches kolloides Molybdänsulfid (Jordisit).- Zeitschrift für Chemie und Industrie der Kolloide 4, 190. Palache, Charles, Harry Berman & Clifford Frondel (1944), The System of Mineralogy of James Dwight Dana and Edward Salisbury Dana Yale University 1837-1892, Volume I: Elements, Sulfides, Sulfosalts, Oxides. John Wiley and Sons, Inc., New York. 7th edition, revised and enlarged: 331. Staples, Lloyd William (1951): Ilsemannite and jordisite. American Mineralogist 36, 609-614. American Mineralogist (1971): 56: 1832. Kao, L., Peacor, D.R., Coveney, Jr., R.M., Gengmei Zhao, Dungey, K.E., Curtis, M.D., Penner-Hahn, J.E. (2001): A C/MoS2 mixed-layer phase (MoSC) occurring in metalliferous black shales from southern China, and new data on jordisite. American Mineralogist 86, 852-861. 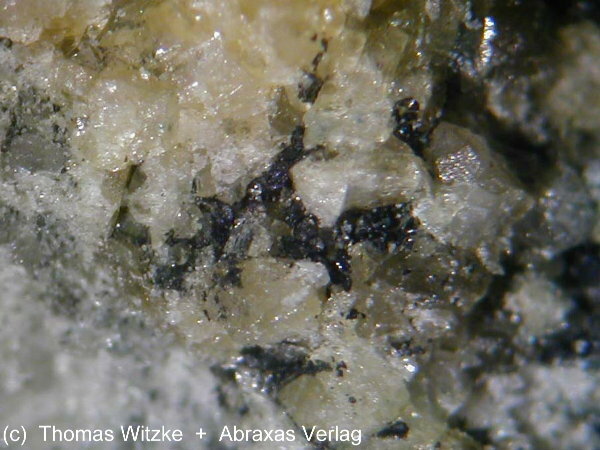 WABER, N., SCHORSCHER, H.D., & PETERS, T. (1992) Hydrothermal and supergene uranium mineralization at the Osamu Utsumi mine, Poços de Caldas, Minas Gerais, Brazil. Journal of Geochemical Exploration, 45, 53-112. Min, M.-Z., Luo, X.-Z., Mao, S.-L., Zheng, D.-Y., and Shen, B.-P. (2002): Ore Geology Reviews 19(1/2), 79-93. Dahlkamp, F.J. (2009): Uranium Deposits of the World. Springer (Berlin, Heidelberg), pp. 31-156; MENG, Y., FAN, H., WANG, F., CHEN, D., & WANG, S. (2010). 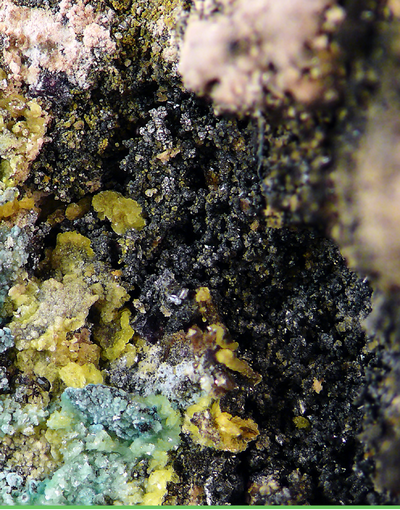 Mineralogical Characterization of the 460 Deposit, Guyuan Area, Hebei Province, China. Geosciences, 27(3), 149-154.
ⓘ Dazhuanggou Mo deposit ? ⓘ Dahu Ni-Mo-PGE deposit (Zhangjiajie Ni-Mo-PGE deposit) ? Shen Weizhou and Liu Changshi (1996), In: Wang Dezi, Ren Qijiang et al. (eds. ): The Mesozoic Volcanic-Intrusive Complexes and Their Metallogenic Relations in East China. Science Press (Beijing), 112-126. Sejkora, J., Breiter, K.: Historický rudní revír Krupka, Krušné hory. Bulletin mineralogicko-petrografického oddělení Národního muzea v Praze, 1999, roč. 7, s. 29-45. Zap. Vses. Mineral. Obsch. , 1962, 91 (1), 67. Anthony, J.W., et al (1995), Mineralogy of Arizona, 3rd.ed. : 263; Petersen, R.G. (1960), Detrital-appearing uraninite in the Shinarump Member of the Chinle Formation in northern Arizona, Econ.eol. : 55: 138-149; Peirce, H.W., S.B. Keith and J.C.Wilt (1970), Coal, oil, natural gas, helium, and uranium in Arizona, AZ Bur. Mines Bull. 182: 103-159, 202-289. Troxel, Bennie Wyatt & P.K. Morton (1962), Mines and mineral resources of Kern County, California: California Division Mines & Geology County Report 1, 370 pp. : 330, 332; Pemberton, H. Earl (1983), Minerals of California; Van Nostrand Reinholt Press: 79. NMBMMR Memoir 15 Geology and Technology of the Grants Uranium Region; Austin, S.R., 1983, An investigation of sedimentary, mineralogical, chemical and color patterns and associations in the Rio de Oro mine, McKinley County, New Mexico: U.S. Department of Energy Report GJBX-30(83), 47 p.